These drawings were generated by looking at a friends Facebook photographs of women at protests in Tahrir Square, Egypt during the revolutions in 2011. The drawings are all single lines, rendered blind -by not looking at the paper but at the photographs to register what is most important in the frame as the pen moves across the page. They exist as imprecise, emotive interpretations of a historic moment. 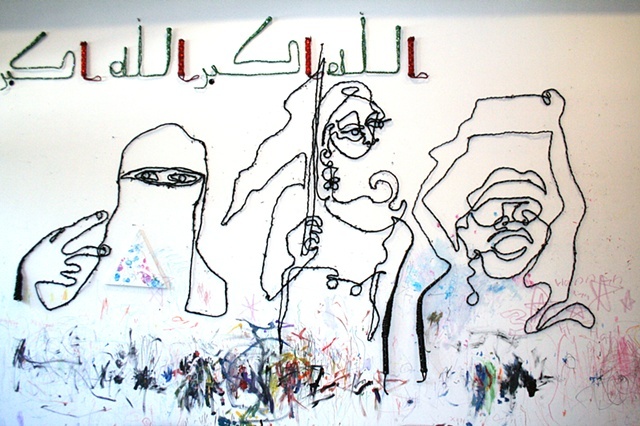 Some of them are further translated into larger drawings on the wall, rendered in whips.